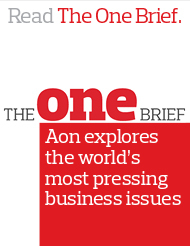 The One Brief is Aon's weekly guide to the most important issues affecting business, the economy and people's lives in the world today. Aon's mining team is your off-site risk management department. Aon combines a breadth of experience and knowledge of mining exploration and site operations with a desire to understand the complexities of your activities around the world. Our team is comprised of professional engineers, lawyers, insurance professionals and risk managers, all dedicated to your risk solutions. We help you turn risk into opportunity. Experience - we understand the questions and risks involved in mining exploration and operations. Diversity - A wide range of solutions from directors' and officers' liability to environmental risk, and much more. Global and local presence - Aon's 500 offices in 120 countries worldwide - 25 of which are in Canada - allow us to work where you do. Innovation - Solutions like Aon's annually-released Political Risk Map and the Global Risk Insight Platform (GRIP), provide insights you can use.